Wild oats (Uvularia sessilifolia) is native to the eastern half of North America. In Minnesota it blooms in April and May in the edges and openings of moderately moist forests. The leaves are stalkless but do not surround the stem at the base. A solitary, cream-colored flower is produced near the end of the stem but is easy to miss. The flower has three petals and three petal-like sepals (six tepals). It droops downward near the end of the stem and is somewhat concealed by immature, drooping leaves. 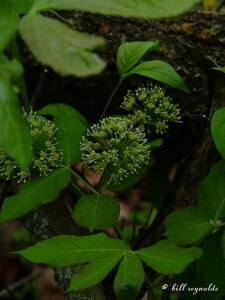 In late spring the flower is replaced by a greenish to egg- or pyramid-shaped, yellowish-brown, three-celled capsule. 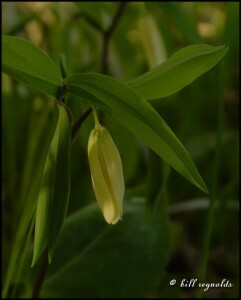 Wild oats is much less common than its close relative, large flowered bellwort. The latter is a taller plant with larger leaves that surround the stem at the base, up to three flowers per plant, and yellow, twisted tepals. This entry was posted in Plants and tagged Uvularia sessilifolia, wild oats on June 21, 2014 by John Valo. 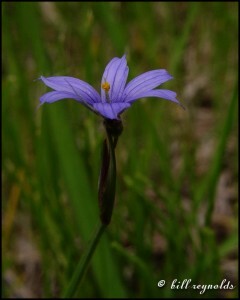 Prairie blue-eyed grass (Sisyrinchium campestre) is misnamed. It is not a grass but a member of the Iris (Iridaceae) family. It is found in full sun in dry to moderately moist upland prairies, meadows, and sometimes woodland openings. It appears as a tuft of 2 to 6 narrow, grass-like leaves and one or more narrow flowering stems. The stems are leafless and conspicuously winged. From May to July a cluster of 1 to 11 flowers appears at the end of the stem. The flowers are pale violet, light blue, or white and have a yellow center. There are four species of blue-eyed grass found in Minnesota and they can be difficult to tell apart. To identify the species take note of the waxiness of the leaves; the flower color; the number of flower clusters; the color of the bracts below the flower cluster (spathe), strongly tinged, lightly tinged, or not tinged at all; and whether the margins of the outer spathe bract are united at the base. This entry was posted in Plants and tagged prairie blue-eyed grass, Sisyrinchium campestre on June 15, 2014 by John Valo. Northern small yellow lady’s slipper (Cypripedium parviflorum var. parviflorum), also called lesser yellow lady’s slipper, inhabits wet areas. It is found in the northeastern Minnesota in rich conifer swamps on moss-covered peat. In the lower Minnesota River valley it is found in calcareous fens. In northwestern Minnesota it is found in wet prairies, wet meadows, and wet aspen woodlands. It is also found in hardwood swamps, upland hardwood forests, and roadside ditches. The large showy flowers appear from May 20 to June 30, with peak blooming time June 5 to June 15. Do not touch. The hairs on the stems and leaves cause dermatitis in some people. 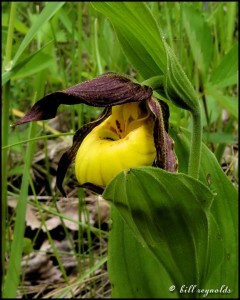 This entry was posted in Plants and tagged Cypripedium parviflorum var. parviflorum, northern small yellow lady's slipper on June 15, 2014 by John Valo. This spring wildflower is found in moist to dry woodlands and thickets throughout Minnesota except for the southwest corner. In early spring it appears as three reddish-green compound leaves held parallel to the ground at the end of a 12″ to 24″ long stalk rising from an underground stem. Each leaf has five leaflets and the plant is easily mistaken for shagbark hickory. Later in the spring it produces usually three globe-shaped flower clusters on stalks that also rise from the underground stem. The flowering stalks are shorter than the leaf stalks and the flower clusters are usually hidden beneath the leaves. At flowering time the leaves are green with no trace of red. This entry was posted in Plants and tagged Aralia nudicaulis, wild sarsaparilla on June 2, 2014 by John Valo.